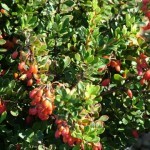 A dense, rounded shrub. Very tight, tidy form. 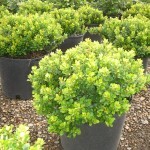 The foliage is rich green when new, maturing to a lustrous, deep green. This gives the plant a very fresh appearance. The fall color is yellow. Tiny yellow flowers may appear in early spring, followed by bright red berries in the fall. It prefers a site with good drainage and full sun. 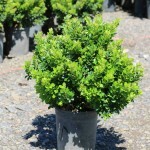 Use as a low hedge or for mass planting.